I've had several questions about straight line quilting with a free motion foot, so I thought I'd do a little rundown of what I've learned by using this technique. --It works very well for quilting specific sections of a quilt. --It allows you to work back and forth, without turning the entire quilt in your machine each time you change direction. --It gives your lines a free form, sketchy feel. --There is far less fabric shifting because the free motion foot floats over your fabric. You can avoid the shifting or "V" formation that sometimes occurs (or always occurs, for me!) when using a walking foot. --Stitch length. With a walking foot your machine determines the stitch length. When you are free motion quilting, it's all up to you! If you've done some (or any) free motion quilting, this isn't anything new. --Perfectionism. If you are going to try this technique, remember that this isn't all about straight lines. It's a free form approach. You need to allow yourself some errors and realize that in the big scheme of things the wobbly lines are charming. No one is going to point out (or circle) your errors. There are times to rip stitches and there are times to just let them go and keep moving forward. It's best to decide before hand to let a few things slide. (I know I had to!) If they really bug you, rip them out. --Hold your hands in a hoop formation and then guide the quilt slowly. If you have an extended table for your machine, this would be a good time to use it. --Try gently pulling the quilt from behind the foot with your left hand and guiding the quilt with your right hand. I used each of these techniques about 50% of the time. Do what is comfortable and what works for you. I made things more difficult for myself and outlined each section with my walking foot and then did the free motion straight line quilting. The reason? I wanted to have a nice crisp line to start. I will certainly do the same thing again when I use this technique in the future. Here's a rough little drawing of my stitching lines. I connected each of my lines of stitching by doubling over the outline stitching that I did with the walking foot. I wanted to have as few starts and stops (in regards to thread) as possible. --Keep an eye on your tension on the back of your quilt. Some threads that I used held the tension very well no matter which direction I sewed in. Some threads, not so much. Keeping an eye on the back and catching any problems early saves some stitch ripping time. Ask me how I know! --Support your quilt well. I set up my ironing board directly to the left of my desk and at the same height. This supports the bulk of the quilt and allows me plenty of space to spread it out as I'm working. It helps so much! I'd encourage you to give straight line quilting with a free motion foot a try. It is a lot of fun! Starting on a mini quilt or something small scale would be a good way to practice. If you have any questions, I'll try to answer them in the comments. Question: when I use my walking foot to straight-line stitch, I use it as a guide to determine space inbetween the lines. How would you do this with a walking foot? Or would I have to draw out the design beforehand with a ruler? I'm definitely going to try this on a patchworky quilt as I love the look of the vertical and horizontal lines side by side but have been dissuaded by all the turning or having to secure so many ends. Thanks for the idea an tips! 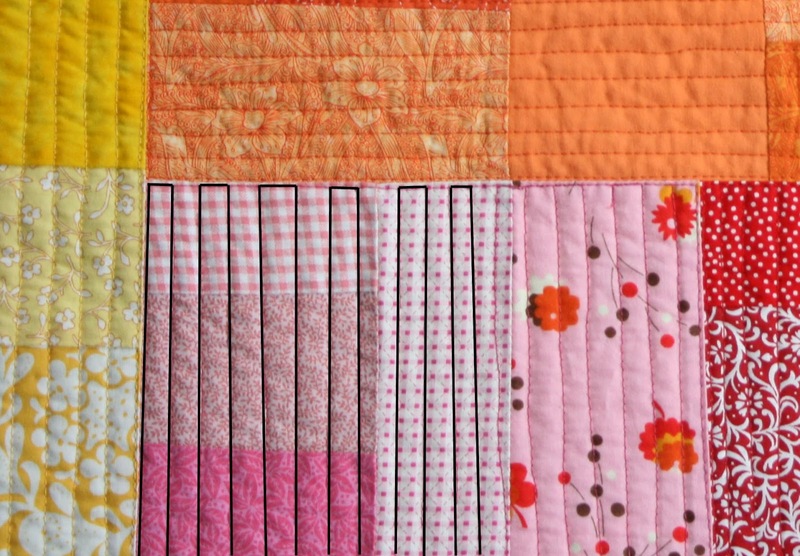 I love the look of the straight line quilting. Just wondering what the back looks like with all those thread changes? I've used this method several times and like the results. Do you notice a difference in the look of the stitches when you go away from you as opposed to going toward you? Mine sometimes look really different. looks fantastic...and thanks for all the great tips too! Thank you for sharing! The diagram on the last photo is really helping me to see how you quilt! Nice post with some great tips. I just may try this. Great post! Very informative and helpful. Thanks for sharing the knowledge (and tips). Yup, exactly like I'm doing it! Thanks for the tips! This is really helpful - thank you! Very helpful! You have taught me so much and I thank you for it. Great tips! And thank you for the reminder that wobbly lines are charming! Thank you for sharing your very helpful tips! I will definitely be giving this one a try! thanks for your idea and spirit in quilting. it make me excited to do quilts... and now, I have managed to finish my first quilts. thank you. I l-o-v-e the quilting on this! Thanks, that was helpful; but I want to add that "machingers" or quilting gloves (even plastic-coated garden gloves work), are worth every penny. It helps you "grab" the fabric easier. I was sceptical when buying them, but wouldn't go without them now! Setting up the ironing board at the same height as the machine is brilliant! I always struggle with supporting the weight of the quilt off the left side of the machine. I'll definitely try this tip next time I quilt... thanks for all the hints and advice! Great post and tips, I must try this, the results look far better than the perfect straight lines made with the walking foot. I just eyeball it. I do use the width of the foot as a guide (and add on a little bit more, or else my lines would be too close together). 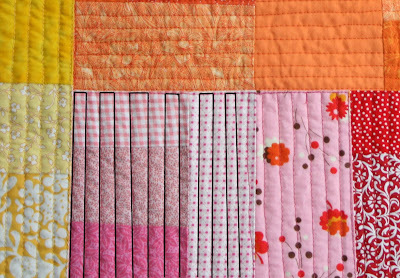 In this quilt, the patchwork helped to guide my lines as well. In one larger section I did mark lines every 3" apart, just to keep me on track. Hope that helps! I used a busy print on the back, which is also multi colored, so the thread changes are a bit muted. It worked very well! I'll try to show photos when I post the finished quilt. You are one of those fearless machine quilters. I, on the other hand, cling to my walking foot like a security blanket. Love your quilting BTW. Thank you. I keep my needle down when I stop quilting in the middle of a line. It helps to heep a streight line when you start sewing again. Thank you for all the good thoughts. Even though I have a lovely new machine I scared myself the first time I played with fmq, but am determined to give it a whirl again this weekend using your advice! I always feel so silly with my bright yellow quilting gloves, but they work SO well! Thank you for this little tutorial. I've wanted to try this for a while, but was just too chicken! Now I feel braver! I want to echo the thanks others have given you for writing this post. Thanks for taking the time to work it up for us. I stumbled on this blog while looking for a binding tutorial, found yours from 2008! I really liked that tutorial and all of the pictures, Im a very visual learner. While browsing through the rest of your blog I came up on this post. I have a small, basic starter machine and love the idea of using an ironing board for the half of the quilt not being worked on. Needless to say I have bookmarked your blog and plan to visit regularly! Thank you! I was trying to do some straight line quilting and it wasn't working, after some google-ing I realised I needed a walking foot, (which I don't have) then I found this. Free motion straight lines, mine are not as straight as yours but they're great. I think they add a different quality to the quilt. I also use your binding tutorial - I'm just a beginner in this game, but its so satisfying. Also helps that baby slept 3hrs this morning! Thanks a lot for you help!